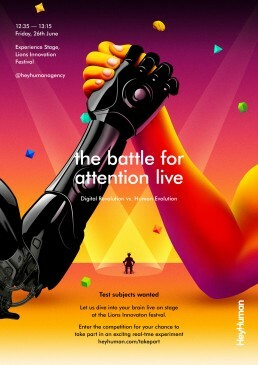 See the real-time battle between technology and human attention unfold on the Experience Stage. Session will bring to life the neuroscience concept of “cognitive load” and the challenges it poses for creativity. In the “economy of attention”, there are the demands of digital messaging outstripping our cerebral supply. The idea was to show a human arm wrestling a robot.